The Highlander staff standing on the steps of Seaholm High School after a successful day at MIPA. From left, front: Luke Sperling, Photo Editor Caroline Squatrito, Editor-in-Chief Kelsey McClear, Managing Editor and MIPA All-State Journalist Taylor Wyllie, & Advisor and Golden Pen winner Ben Harwood. From left, middle: Meghan Flynn, News Editor Kendall Hitch, Esther Seawell, Student Life Editor Molly Force, & Web Editor Kathleen Davis. From left, back: Graphics Editor Ben Bishop, Community Editor Connor Park, Opinion Editor Kelly Martinek, & Sports Editor David Granadier. 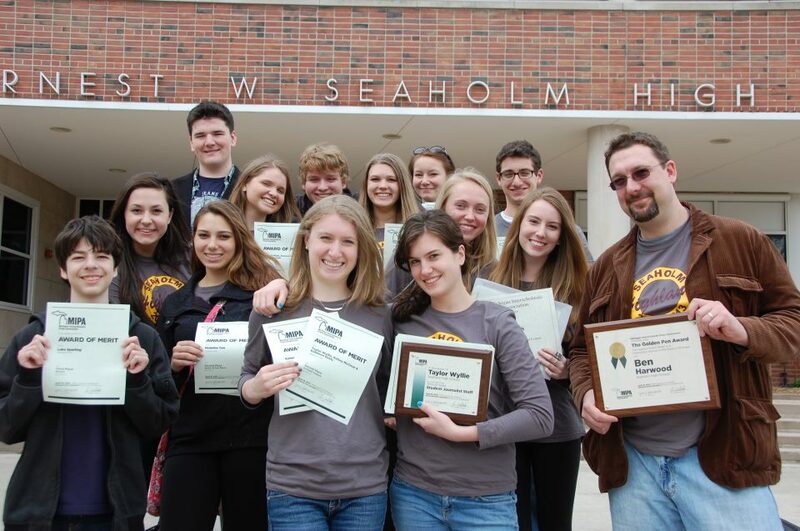 The Highlander adviser, Ben Harwood, was honored with the prestigious Golden Pen Award at the Michigan Interscholastic Press Association awards ceremony, April 15 in Lansing. Harwood was recognized for going above and beyond as an advisor for a scholastic publication. “It is a prestigious honor, reflecting an adviser’s long-term commitment to the highest standards of scholastic journalism,” MIPA says on their website. Harwood has been an adviser for the Highlander for seven years, and has also advised Seaholm’s yearbook and creative writing magazine in the past. Highlander Managing Editor, Taylor Wyllie, has been honored by the Michigan Interscholastic Press Association. Wyllie was one of the 15 named to the 2013 Student Journalist All-State staff. The All-State staff recognizes elite student journalists in Michigan for their outstanding work in the categories of newspaper, yearbook, video, or photojournalism. Wyllie is the fourth straight Editor from The Highlander to be awarded All-State since 2010. The previous recipients were Lanie Barron in 2010, Emily Gordy in 2011, and Simon Schuster in 2012. The Highlander Staff would like to congratulate Wyllie for this acievement.